HOME What is the Attic-Clear? The Attic-Clear is designed to be a universal mounting rack and will hold iPhones, Smartphones (with or without their protective cases) as well as GoPro cameras and virtually any camera or device that has a tripod mount or that will fit in the Attic Clear's padded clamps. Light Duty is built on a black camera extension pole, 7 feet long one flash light holder.. Heavy Duty (Pro) is built on an industrial strength 3/4 inch pole with 2 x 24" extension tubes (Black or Red pole). 20 foot advantage if your about 6 feet tall, dual Flashlight holders. We accept Purchase Orders, let us create a quote for you. Please email us and we will be happy to send you a quote or Invoice. The original and Light Duty Attic-Clear are built using standard industry camera type extension pole. It is 7 feet in length and does not come with any extensions. The Attic-Clear Pro is built on a 3/4 inch pole shaft which provides Industrial Strength. It comes with two 24 inch extension tubes. The unit will reach to about 20 feet high when held by a 6 feet tall person . Both units come in a black padded Gun Case. 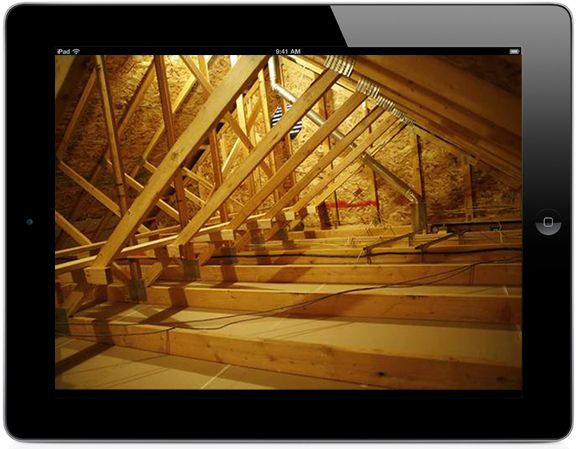 The Pro units come with software that can be down loaded (upon request) and will allow one iPhone to be attached to the top of the Attic-Clear pole and one iPhone or iPad that the software will treat as a monitor via the built in Bluetooth. Simple to use!